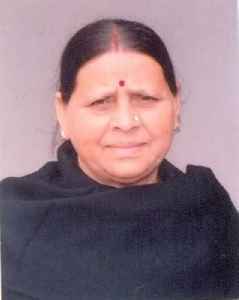 Rabri Devi Yadav is an Indian politician from the state of Bihar. She is a Member of the Legislative Council for Bihar Vidhan Parishad who has served three terms as the Chief Minister of Bihar, as a member of the Rashtriya Janata Dal political party, between 1997 and 2005. She is the wife of the Indian politician Lalu Prasad Yadav, former Chief Minister of Bihar and former Railway Minister of India. She is the current Leader of Opposition in Bihar Legislative Council. She is illiterate.